IRCTC's new semi luxury train Tiger Express embarked on a "Roaring Journey" on World Environment Day, June 5 to experience the best of wildlife in Madhya Pradesh with some 24 nature loving passengers. By the time the train completed its first and last "tiger trail" of this season, a trial run, on June 10, (parks close from June 15), passengers had experienced among others - a magnificent tiger and its other subjects in the beautiful jungles of Kanha and Bandhavgarh, a mesmerising boat ride in Narmada through marble rocks of Bedhagaht near Jabalpur and a huge waterfall where fishes were trying to jump up-stream and succeeding! "I enjoyed from platform to platform. There's a need to create the culture of love for the wildlife and this train is a step towards that," Raman Kant Garg, who travelled with his son Shaurya, told IANS. He said he will suggest the train journey to his friends and looking at the facilities and the guided tours it was overall cost effective. "Watching the tiger looking you in the eye is beyond words. As we are getting older and softer, we start thinking where our meat is coming from. More sensitization is required towards the environment. This train is for a good cause," Steven Phipps, a retired Combat Engineer from the US who visited India for the first time to experience wildlife, said. "I believe that we must enjoy the jungle and keep the tiger as a bonus," said Raghvendra and his wife Divya, a couple from Maharashtra who had chosen Tiger Express for their honeymoon. The train will return with its five day-six night package in October, while the officials are at work on its costing which may drop in the second journey. "We are working on the costing, it may go down in the next journey. It was a quick decision and we had to manage the entire train within two months," an IRCTC official told IANS. The cost for the AC-first class package for now ranges from Rs 49,500 to Rs 39,500. AC 2-tier ranges from Rs 33,500 to Rs 43,500. For foreign tourists an additional cost of Rs 4,000 is charged for Safari booking at Bandhavgarh and Kanha National Park. The rates seem steep, but given the accommodation in luxury resorts situated at one of the best locations near the National park, air-conditioned road transport in MUVs, delicious buffet, three Safaris and sightseeing at Bedhagaht near Jabalpur, the cost seems justified. The train left Delhi at 3 p.m on June 5 and reached Katni in Madhya Pradesh next morning. From there tourists board cabs to reach the resort at Bandhavgarh and have an evening Safari. The next day they proceed towards Kanha National Park halt, that takes around four hours. The road and little tribal villages on the road makes the journey as beautiful as the destination. After two days stay and two safaris at Kanha, the caravan proceeds towards Jabalpur, to end at a beautiful note at Dhuandhar waterfalls and ride through Narmada. Train returns for Delhi same night. However, on a sad side, the packages targets the upper-middle and higher classes of society only. With the cause of environment in mind, the journey should be made affordable for others too who deserve to see the wildlife with Indian Railways. The semi-luxury train also had a dining car, bathrooms with showers and a small library. 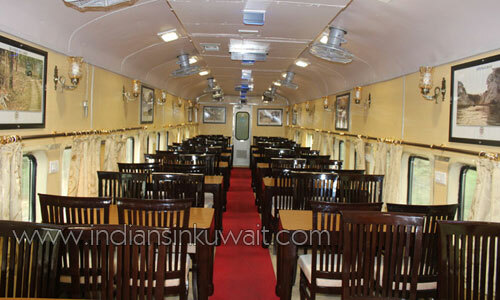 "An abandoned coach was turned into this dining car at Jagadhari workshop in Haryana. This was done in one month's time," said a railway engineer. "I had been to places but never seen a combination like this. It ended on a very good note at the waterfalls. However, It was not publicised and I too received an email because I was registered with IRCTC," said Virpal Singh, who had also been on the Buddha Circuit. "The trip was good but it needs more publicity. Wildlife protection must be sensitized and in that step, I feel that this train is also serving a noble cause," S.K Singh, a Delhi based retired Professor said. The train would begin its regular monthly trips from October onwards after the National Parks reopen following the monsoon. So, start working on your watch list, learn the names of your birds, pack well and please don't use perfume while on tiger circuit.